When you’re completely stuck for an idea. As artists, we sometimes wander aimlessly through this flotsam and jetsam we call life, in an attempt to capture even the smallest sliver of how we perceive it. And while some of us wander, others fill the timeless, empty in-between voids with mind-altering states of being in order to achieve …well, let’s just say a Cartoon. For those of you who are new to creativity, or know someone like us, here’s how we spend most of our days. Find your Usual spot and continue pacing where you left off yesterday. Stand on your head all over the house in an attempt to change your perspective. Consume 11 cups of coffee in an attempt to speed up the creative process. 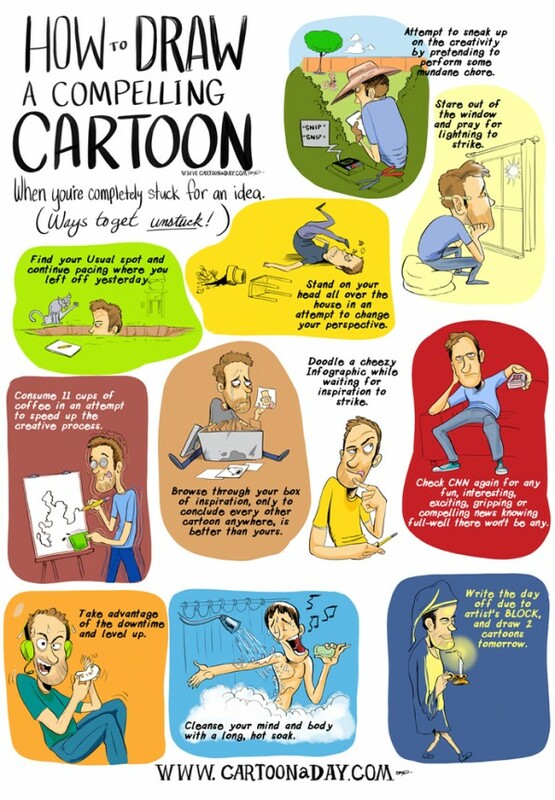 Browse through your box of inspiration, only to conclude every other cartoon anywhere, is better than yours. Take advantage of the downtime and level up. Cleanse your mind and body with a long, hot soak. Attempt to sneak up on the creativity by pretending to perform some mundane chore. Check CNN again for any fun, interesting, exciting, gripping or compelling news knowing full-well there won’t be any. Stare out of the window and pray for lightning to strike. Write the day off due to artist’s BLOCK, and draw 2 cartoons tomorrow.